Hello my crafty friends!! It's Peachy Keen Challenge day once again, and for challenge #59, we're sketching and twisting. In addition to the fabulous sketch we have to follow, Angelica has challenged us to use buttons on our creations. For my card, I used PK-289 Misty Sue and Colby Cheer up stamp set from Peachy Keen Stamps. The double sided patterned paper is from Comso Cricket. I colored Colby with my Copic markers, and added a little sparkle to his tear with some Stickles. Some assorted buttons from my stash and grosgrain ribbon finished this cutie patootie off. I'm so excited that this week I get to tell you that my sweet friend Glora is guest designing with us. Glora makes such beautiful things, and her work is always so inspirational! Please be sure to drop by Glora's Blog and leave her some love on her wonderful work. You'll be glad you did, because not only will you LOVE her creations, but she's giving away some Peachy Keen Goodness that you won't want to miss out on!!! 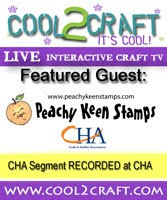 Also, don't forget to drop by the Peachy Keen Challenge Blog to see what ALL of our wonderful, sweet and talented designers have put together for your crafty pleasure. Once again, if you play along with our challenge, you'll have the chance to win a fabulous prize! I truly enjoyed looking at all the creations for PKS Challenge #58, and can't wait to see what this challenge with a twist brings!! Thanks so much for stopping by today. Have a blessed and beautiful day, and of course happy stamping! Such a sweet little mouse! Great job! So adorable! Love your coloring... it always seems to look like a work of art. Beautiful mixture of patterns colors and texture. Love everything about this! This is so cute Lorie! I love your fuzzy little mouse, the designer paper, and your cute flower buttons. Beautiful as always! Soooo sweet Lorie!!! I love the pattern paper as well!